Thrill-seeking tourists visiting Niagara Falls can now enjoy a unique view of the attraction’s three waterfalls thanks to MistRider, a brand new zipline recently tested by reporters at The Guardian. 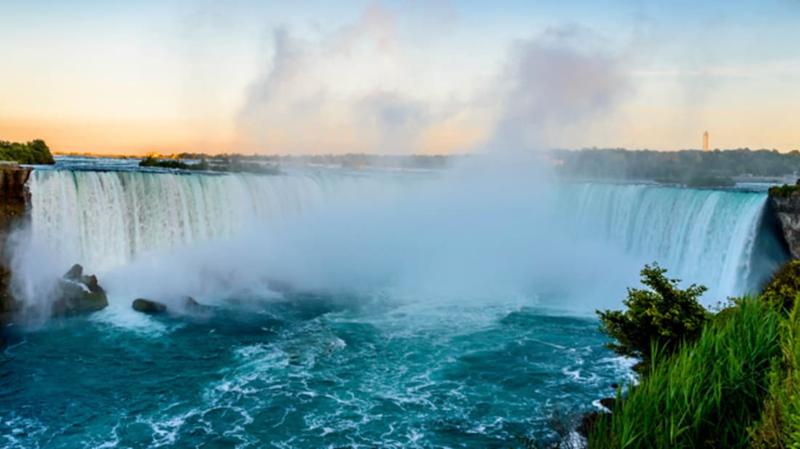 Located on the Falls’ Canada side, the ride sends daredevils soaring about 2200 feet over Niagara Gorge—past the American and Bridal Veil Falls and down towards the Horseshoe Falls—at speeds of up to nearly 50 miles per hour. Once they’ve reached the bottom, riders can catch a rare glimpse of the Falls from a remote viewing platform that suspends them over the Niagara River. The entire journey takes around a minute. MistRider is the brainchild of WildPlay, a British Columbia-based adventure travel company. The zipline debuted Friday, July 15, and later this week, on Wednesday, July 20, it will celebrate its grand public opening, The Toronto Sun reports. Costs for MistRider start at nearly $50 Canadian, or $39 U.S. They might surge to nearly $60 (or a little over $46 USD) during peak hours. Keep in mind, though, that the MistRider isn't for everyone. It offers four side-by-side ziplines, so you and three other people can enjoy the ride together. But as Condé Nast Traveler points out, all riders must be at least 7 years old, and each person has to weigh between 65 and 300 pounds. Niagara Falls is located in Ontario, Canada, near New York State, and straddles the border between the U.S. and Canada. As news outlets point out, the MistRider (along with another new attraction, an aerial obstacle course above the Niagara River’s rapids called Whirlpool Adventure Course) are designed to drum up tourism to the Falls’ Canadian side. Wondering if there will be something similar to MistRider in New York soon? In 2013, New York governor Andrew Cuomo announced that he was setting aside $40 million in funds from private businesses to create attractions like zip lines, rock climbing, and horseback riding for visitors on the Falls’ U.S. side, WGRZ reports—but the region is still waiting for the promised activities to arrive.